Now that Marvel Legends series 5 are beginning to hit the pegs, what's out there that could possibly tie me over? A box set of five X-Men characters of course! I'm actually unsure where I stand regarding box sets that do more rehashing old product then providing new figures for the die hard collector. On one side, I'm happy to see neat new accessories accompanying figures or different head sculpts, but I'm also disappointed that a lot of these features should have been implemented in the regular releases. But since the Marvel Legends figures are so great, I quickly forgot all about that and dived right in. The gift set gives newer collectors a chance to pick up FIVE exclusive Marvel Legends figures at a smaller price point, which in my opinion is always good. In the set are: MAGNETO w/ new face sculpt, GAMBIT w/ leather trenchcoat, WOLVERINE w/ new face sculpt, THE BEAST w/ glasses and lab coat, and the exclusive ROGUE. This is the only place to get the ROGUE figure giving collectors an extra incentive to pick up the set. Wow, I couldn't have asked for a better set up. 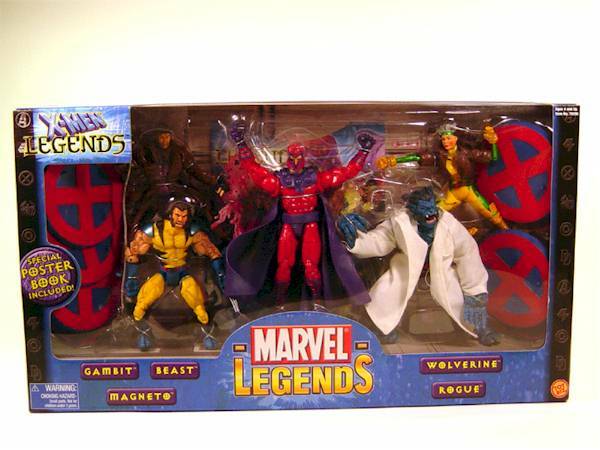 These X-Men Legends are packed in a nice sturdy cardboard box with a large window in the front displaying all the figures in various poses. The stands for the figures are alligned on both the left and the right in perfect view. The box itself is styled to match the general design of the Marvel Legends, complete with stats of each character on the back of the box. It's a fantastic looking set and great for collectors who want to keep their figures in the box. Since many of these figures are repeats and reviewed here before, I'll try to spare the redundancies and stick with the differences. 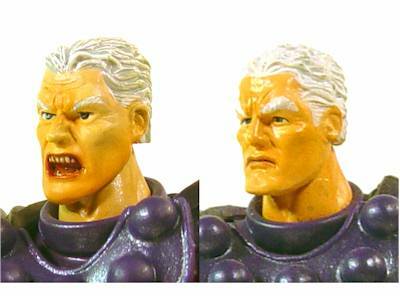 MAGNETO is exactly the same as the first release but is given a more expressive face sculpt. 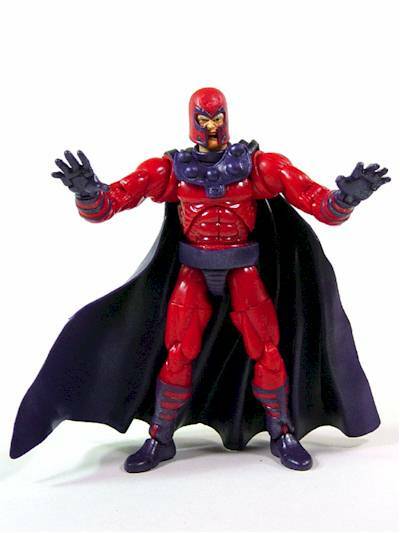 With the helmet, this is a better looking Magneto but I'd prefer the first release when without. 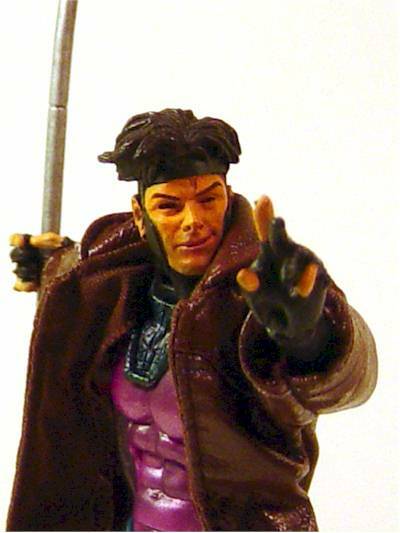 GAMBIT is also identical to the regular release, which is an awesome sculpt as it is. 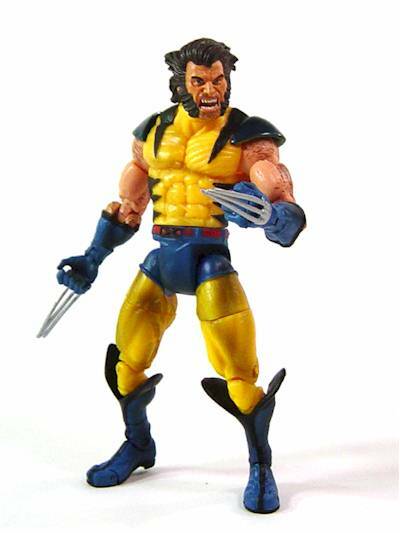 WOLVERINE is also essentially the same but with a brand new unmasked head. This isn't the same as the chase figure either. At some angles, it appears a little off but a few others, the sculpt looks just fine. 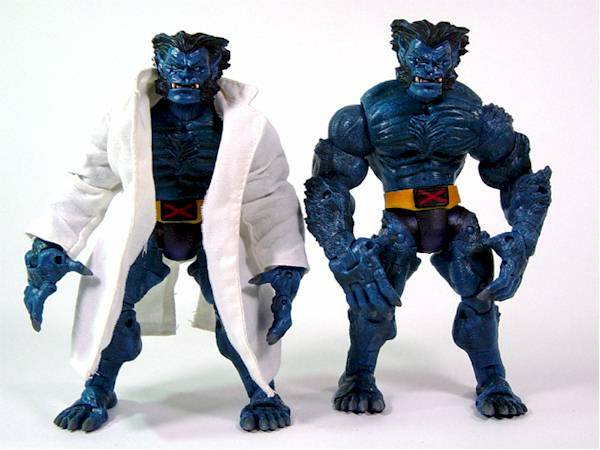 No difference in THE BEAST figure. Identical to regular carded version. 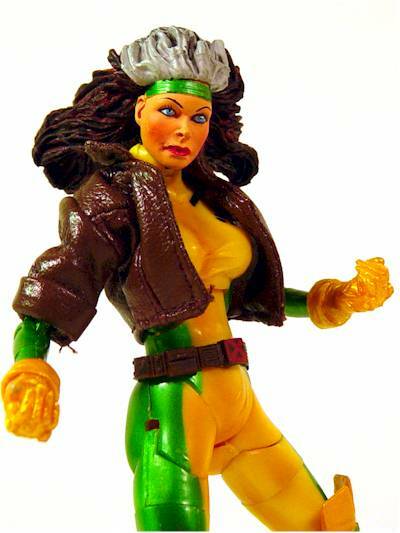 ROGUE makes use of Elektra's body but with extra knee pads and a brand new head. I was a bit disappointed with Rogue's face sculpt. As a fan of the Jim Lee art, this figure looks like a much older woman than expected. I thought the Elektra head was fantastic but Rogue's isn't as impressive. BUT... it could have been much much worse! The paint ops have always been an inconsistency with the figures I pick up, which can be pretty annoying. Fortunately for us, Toy Biz at least provides nice windows for consumers to closely examine the figures. While I picked the best out of the batch, there's still a few smudges here and there. But for the price you pay, it's definitely pretty darn good! As mentioned above, all the repeated characters use the older sculpt. The same also applies for the paint application as well. 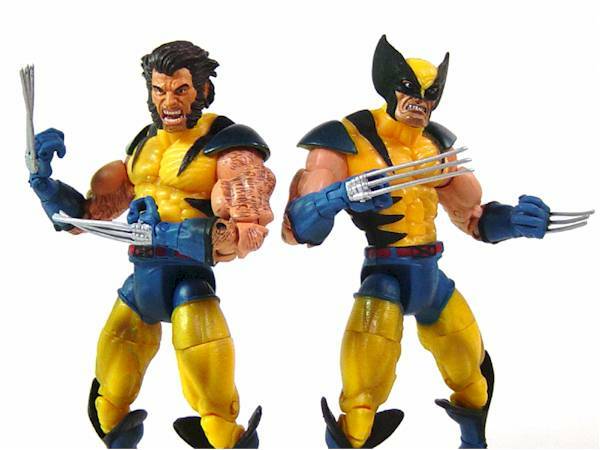 Wolverine does have far more hair on his arms which actually looks better than the previous version. 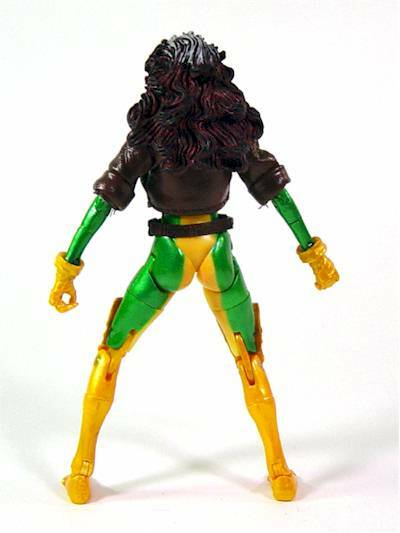 While Rogue uses an existing mold, the paint is entirely new. The Rogue I picked up was pretty clean throughout with solid greens and yellows. Even the "X" symbol on her upper left chest is striking. The face is a little too "made-up" for my tastes but it isn't bad. The hair is also pretty nicely painted here. When it comes to articulation, no other toy line goes as far as the Marvel Legends do. Let's just recap how many points each figure has. On the whole, accessories could have been better all around, but considering how three of these figures have removable coats or jackets, it could have been worse. 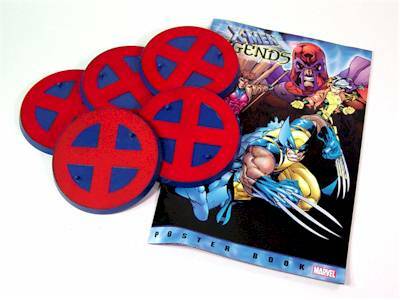 For starters, every figure comes with a display stand designed to resemble the X-Men logo. Each stand has two pegs for better positioning. 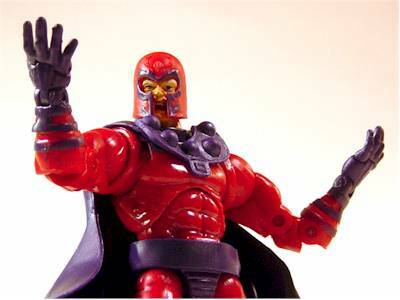 MAGNETO only comes with a removable helmet. WOLVERINE comes with NOTHING. 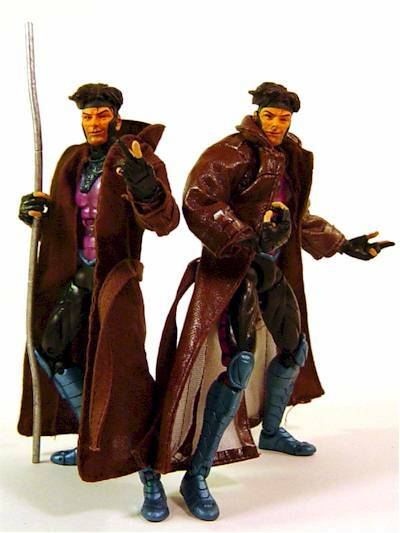 GAMBIT comes with the previously released staff and blast of cards, as well as a leather trenchcoat. 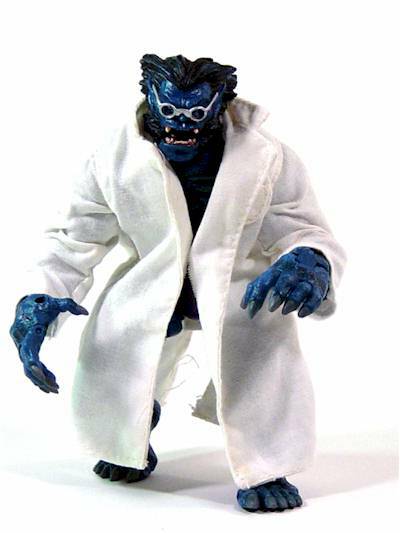 BEAST comes with a pair of glasses and lab coat (very cool). And last but not least, Rogue is equipped with her leather jacket. And finally, we have the colorful poster book. This is, in my opinion, better than a comic book that barely contains the character you just bought. The book contains several illustrations of each character in the set. A very nice addition. The value definitely depends on how much you are expecting to pay for each figure. Toys'R'Us typically charges $8.99 per figure so the asking price of $39.99 is pretty reasonable. But if you're used to paying Wal-Mart prices of $6.99 each figure, then it's definitely not a value. But cost differences a side, it's a good thing Toy Biz made variations to these figures as it would definitely not be worth the purchase. But keep in mind that you are getting SEVERAL repeat characters without bases, and if that's not cool for you, the value would come down by quite a bit. What's not to like about five marvel legends figures? I admit that there should have been at least two brand new characters but I was fairly satisfied with what was given. 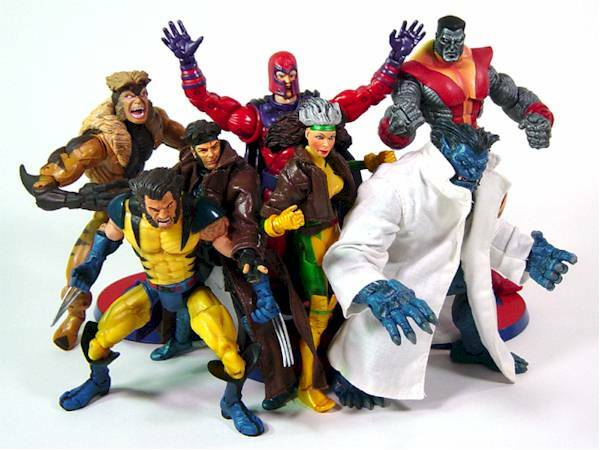 Five super-articulated figures with stands, and colorful poster book make this a must buy if you're an X-Men fan. I picked up this set at Toys'R'Us for $39.99 but I've been hearing reports that it is selling at Wal-Mart for a much lower price!